It’s hard to overstate the importance of a medical or dental practice having a modern, appealing, and easily navigable website. Our culture emphasizes and rewards digital accessibility, and if you rely on outmoded design elements you risk alienating existing patients and may miss out on launching new relationships. As we explained in our 2014 Buyer’s Guide, your website provides one of the best opportunities to develop a professional and lasting first impression. That introduction should be as clean, polished, and innovative as you are. 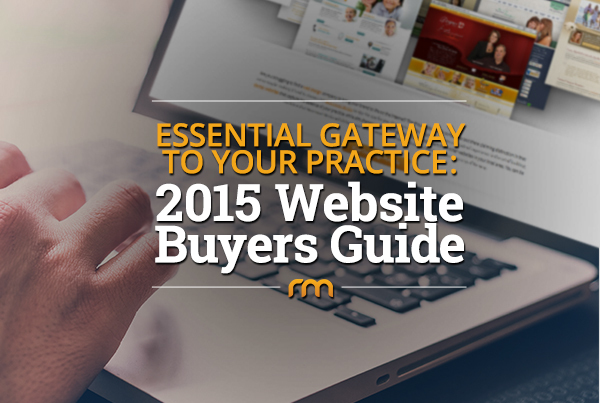 In 2015, your website remains an essential gateway to your practice. As a result, this year we’re highlighting the benefits of maintaining an up-to-date site flush with compelling design elements. Not only will prioritizing quality features help to improve the patient experience, but employing these techniques typically also makes your site appear “fresh” longer—one of the easiest ways to cut long-term expenses. So what, exactly, can you do to make your practice website more durable? We present our 2015 Buyer’s Guide on how to extend your website’s shelf life. Designed to automatically resize to fit the screen of any Internet-compatible device, responsive website design continues to be an absolute necessity for dental and medical practices. Google is actively rewarding adaptable sites with a “mobile-friendly” tag in searches, and the search engine will likely stop indexing sites that don’t offer this feature in the near future. This attractive design element was one of our favorites from last year, and we predict this style will remain popular for years to come. Parallax scrolling creates a beautiful transition between graphics (typically the background and foreground images) as they move at different rates while you scroll vertically down the page. Beautiful and distinctive, the parallax scrolling style helps to distinguish your site from more conventional designs. It’s easier to understand the concept by viewing the site in action. You can see an example of this design at Dr. Louis P. Bucky’s website. As the name implies, a fixed position background involves having a background image remain anchored while the foreground objects move up or down as you vertically scroll along the page. Simple and classic, this design element is a popular, no-fuss option that offers a professional and lasting appeal. For an example of this style, see our customized website for Eureka Smile Center. Instead of a static stock image for the background, this option displays a silent film played on a loop. The video background can be fixed as well, adding an additional layer of visual interest as the visitor browses the length of the page. This innovative style is cutting edge but also refined, meaning it won’t appear dated in two years. Pure Aesthetics offers an excellent example of this feature. The shelf life of most websites is around three to five years on average, but you can help extend that number by implementing innovative design elements such as parallax scrolling. While no site can remain ageless forever without occasional updates, investing in the fundamental ingredients serves to enhance the site’s resiliency and lead to immeasurable savings down the line. If are interested in some of these innovative design elements and would like to redesign your website this year, contact us today. We are more than happy to discuss how our team can work with you to customize a state-of-the-art website design that reflects your practice.